Jayl Funk kicks off the EP with his oldskool funk baster “Monkey Phonk” that makes you wanna move your feet from the very first second. Nu funk at its finest with a groovy bassline and a funky guitar all united by a smooth break that sounds just like it did “back in the days”. Jayl Funk’s brother L.U.C. delivers a smooth and rocking remix of “Monkey Phonk” accompanied by a fresh BadboE break. The funk moves on with some boogie basslines and funk horns and piano. Infamous toughens up the funk by adding his signature ruff and dirty bassline to his groovy breaker “Strike3”. To the classic sounds of a funky 70s guitar, Infamous slaps us around with smooth breaks and some mind-blowing synth! 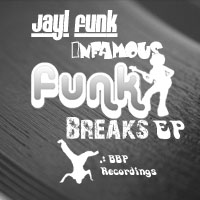 Jayl Funk pushes the funk to the limit with his oldskool remix of “Strike3” in his quest to keep everyone busy on the dancefloors. With a groovy break and some catchy funky elements this remix is bound to get a spot in all the funky DJ-sets!